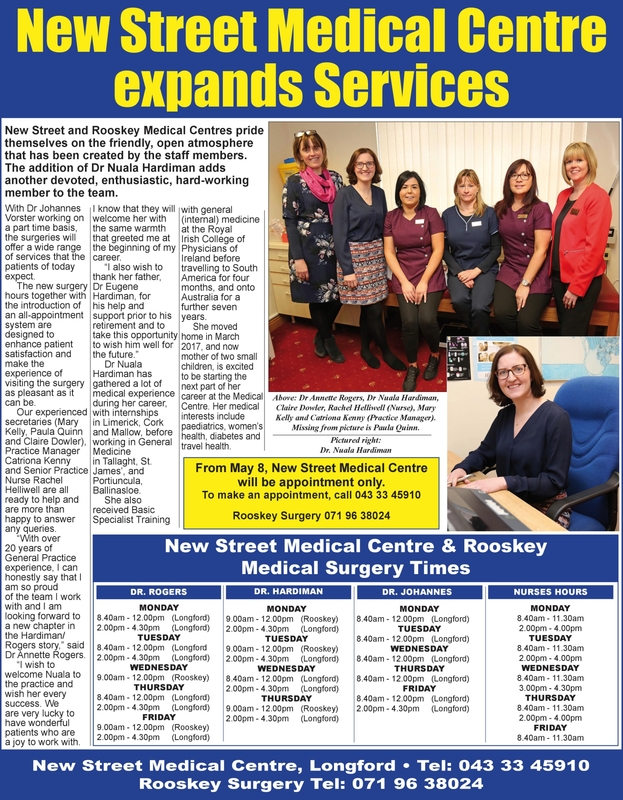 New Street and Rooskey Medical Centres pride themselves on the friendly, open atmosphere that has been created by the staff members. The addition of Dr Nuala Hardiman adds another devoted, enthusiastic, hard-working member to the team. With Dr Johannes Vorster working on a part time basis, the surgeries will offer a wide range of services that the patients of today expect. The new surgery hours together with the introduction of an all-appointment system are designed to enhance patient satisfaction and make the experience of visiting the surgery as pleasant as it can be. Our experienced secretaries (Mary Kelly, Paula Quinn and Claire Dowler), Practice Manager Catriona Kenny and Senior Practice Nurse Rachel Helliwell are all ready to help and are more than happy to answer any queries. “With over 20 years of General Practice experience, I can honestly say that I am so proud of the team I work with and I am looking forward to a new chapter in the Hardiman/Rogers story,” said Dr Annette Rogers. “I wish to welcome Nuala to the practice and wish her every success. We are very lucky to have wonderful patients who are a joy to work with. I know that they will welcome her with the same warmth that greeted me at the beginning of my career. Dr Nuala Hardiman has gathered a lot of medical experience during her career, with internships in Limerick, Cork and Mallow, before working in General Medicine in Tallaght, St James’, and Portiuncula, Ballinasloe. She also received Basic Specialist Training with general (internal) medicine at the Royal Irish College of Physicians of Ireland before travelling to South America for four months, and Australia for a further seven years. She moved home in March 2017, and now mother of two small children is excited to be starting the next part of her career at the Medical Centre. Her medical interests include paediatrics, women’s health, diabetes and travel health. From May 8, New Street Medical Centre will be appointment only. To make an appointment, call 043 33 45910.